The first lighthouse shipping encounters upon entering the St. Lawrence River from Lake Ontario is the Rock Island Lighthouse. The original lighthouse was built on the island in 1848. This was replaced in 1882 by an iron tower which has been placed in several locations throughout the years. Today the site is open to the public as Rock Island Lighthouse State Park a serves as a wonderful example of a complete light station. Canals were constructed along the Great Lakes in the early 1800’s which led to more commerce and increased maritime traffic in the St. Lawrence River which served as a conduit to the Atlantic Ocean. 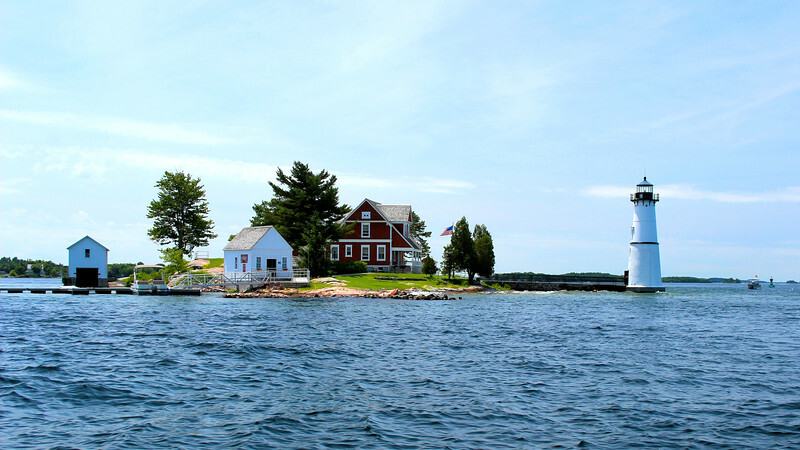 An 1838 navy report to Congress recommended the establishment of lighthouses in the Thousand Islands region of the river to help mark various islands and obstructions.